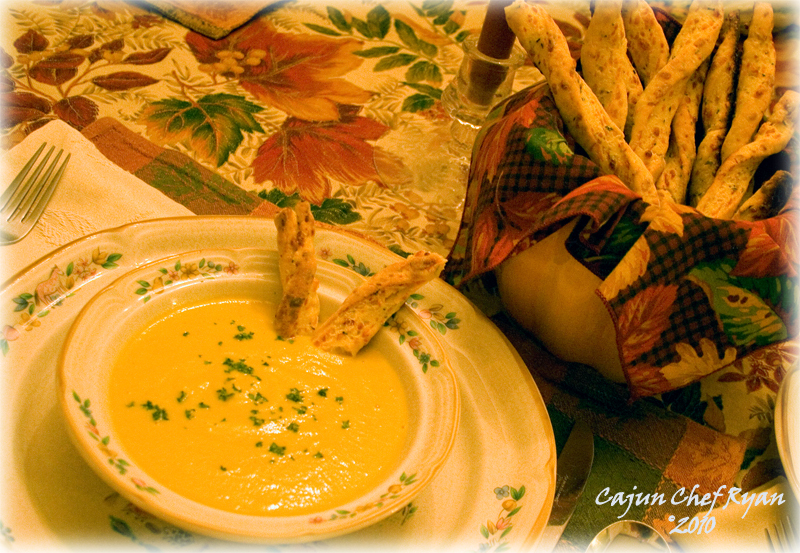 Roasted acorn squash, carrots, onions, leeks, Granny Smith apples, and holiday spices blended with cream and served with Vermont Cheddar Rosemary Bread Sticks. I will submit the bread sticks recipe in a subsequent post. Procedure Steps: Preheat oven 350° F.
On a baking sheet, place the acorn squash, cut side down, and then add a little water and cover with foil, then roast until soft, about 45 minutes. Allow to cool, and then scoop out the squash flesh and set aside. In a soup pot, heat olive oil over medium high heat. 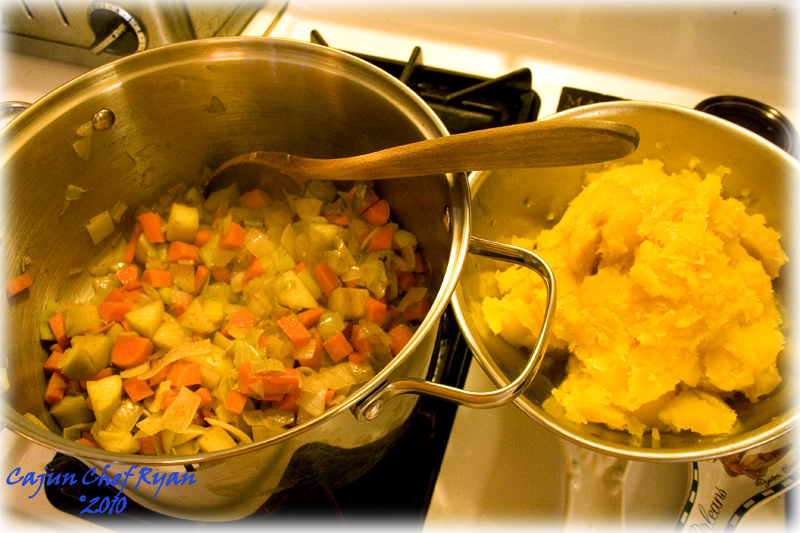 Saute the carrot, apple, onion, and leek in the olive oil until soft, stirring occasionally, then season with ginger and allspice, and then add the squash and the chicken stock. Bring to a boil while stirring well, and then reduce heat to a simmer over low heat for 20 – 30 minutes, stirring occasionally. 3. Remove the pot from the heat and puree with a hand-held immersion blender. Alternatively, in batches, puree in a blender or food processor until smooth and return to the pot. 4. Stir in the heavy cream and simmer for another 5 minutes then and keep warm. To Serve: Remove the soup pot from the heat and ladle the soup into bowls, then garnish with fresh chopped parsley and serve with the warm bread sticks. Wow now this is amazing looking along with those bread sticks with cheddar… Lovely presentations and fabulous flavors here! I love squash soups. This is a nice change from the classic butternut. Can’t wait for the cheese breadstick recipe! Indeed, bread sticks recipe will be coming soon! Love the squash, but the touch of the Vermont cheddar and rosemary?? YUP! I always love a good soup! 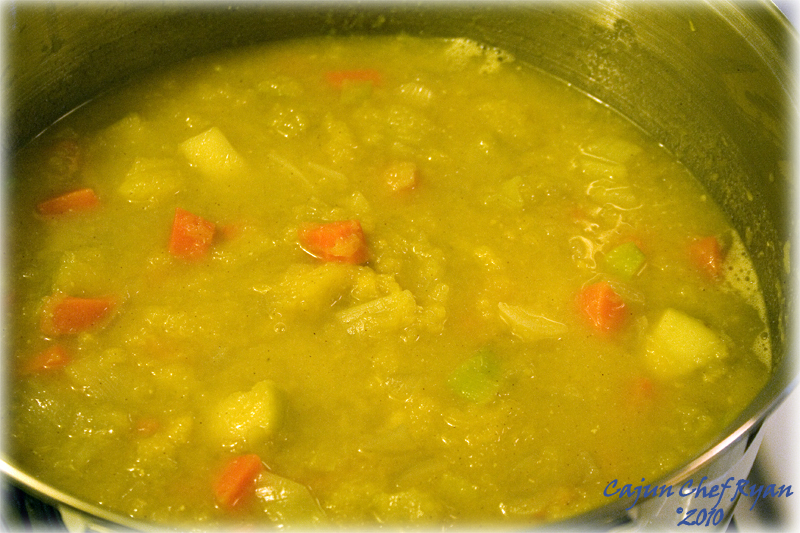 This soup sounds wonderful – i love the addition of apple and excellent flavors with allspice! It’s only 5:50am, but my house is could and I’d really like a bowl of this soup!!! Butternut squash soup is my favorite at Brueggers. I have attempted to make it at home before but it was a fail (it had more onion than apple.) I will have to try your recipe next time, it looks delicious! This presentation is marvelous! I’ve definitely been on a soup binge lately, so this is getting bookmarked for sure! I would absolutely LOVE IT-IF YOU WOULD POST BOTH RECIPES ON MY BLOG!! THEN, I WOULD TELL ALL MY BUDDIES ABOUT IT ON FACEBOOK AND TWITTER! I love the way the soup looks before you pureed it. 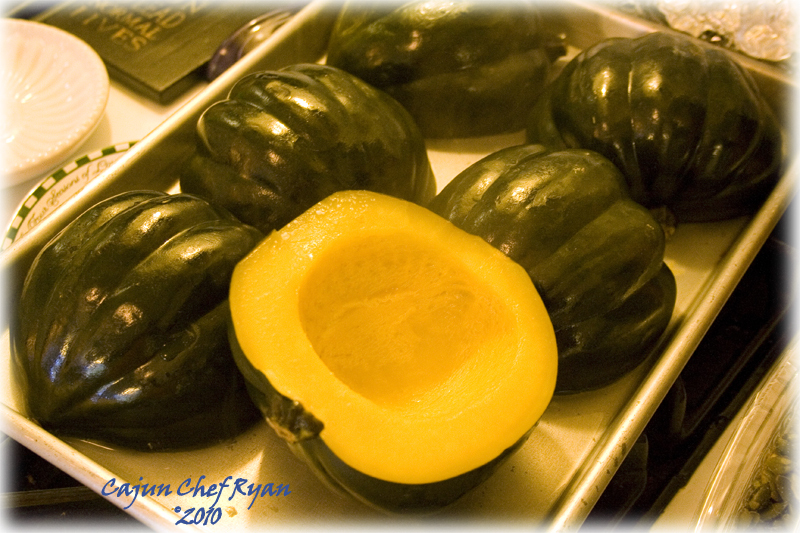 I wonder how long it would take if I cooked the acorn squash in my convection oven?? I got a really nice one that I would love to try out. It cooks in about 30% of the time conventional ones do. Once again, thanks for making my dinner long distance! NOTE: If you want to put in quotes any of the things I say about your dishes, you are more than welcome to! I would love to post some recipes on your site as a guest, however, they will need to be totaly original and never before published on my blog or in print in the past, this is in keeping with the true spirit of “Guest Blog Posting”. I need to come up with several guest posts soon, and yours will be the third in line that I need to do. As far as the soup goes, yes a convection oven is okay, you just need to adjust the cooking time by roasting it maybe 15 minutes less, or reducing the temperature by 15 degrees. The soup looks so lovely. I also like the color. Thanks for posting.